When rules are created and the major social media players draw lines, innovative companies figure out ways to beat the system or use these new standards to their advantage by doing what has never been done before. One platform with restrictions is Snapchat. This social media platform is evolving and growing at such an accelerated pace that every business wants to figure out how to use Snapchat to their advantage. With a visual-centric focus and a user population made up of a desirable millennial audience, Snapchat is becoming a force to be reckoned with. However, there is no easy way to get social media users to add a business on Snapchat without going through the app. Other platforms, like Facebook and Twitter, can easily be inserted as social icons on a company website where users simply point, click and be redirected to the company’s social media page. Snapchat, however, is an entirely mobile platform and there’s no way to redirect audiences to an account from a desktop. Couple that with the lack of ROI and reporting data available on Snapchat, and this platform has hit some roadblocks. The Huffington Post noticed this lack of inbound direction toward Snapchat and was unsatisfied. Director of Growth Kiki Von Gilow understands the importance of reaching Snapchat’s demographic, the highly coveted millennial generation. 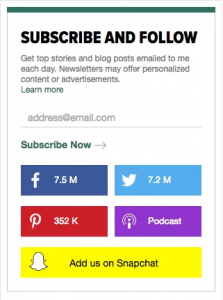 As a solution, the Huffington Post designed its own “Add us on Snapchat” button and added it to the website’s “Subscribe and Follow” section. Readers can simply click on the button and be directed to the Snapchat barcode avatar of the Huffington Post. The Huffington Post didn’t wait for Snapchat to release a desktop-friendly button to convert readers into followers. Instead, it created its own to drive more traffic, increase its audience and engage a new and emerging millennial demographic. The Huffington Post beat the social media system, and for that I think it deserves a round of digital applause. Paxton Mittleman is a rising senior at the University of Delaware majoring in mass communications. She currently serves as the vice president of external affairs for UD’s PRSSA Chapter. When she’s not serving her PRSSA community, she is tweeting from her social media ambassador account, @BlueHenPaxton, developing her startup, The H Factor Media, or volunteering with the sisters of Gamma Sigma Sigma. Connect with her on LinkedIn or visit her website.